Posted on March 23, 2018 at 1:10 pm. 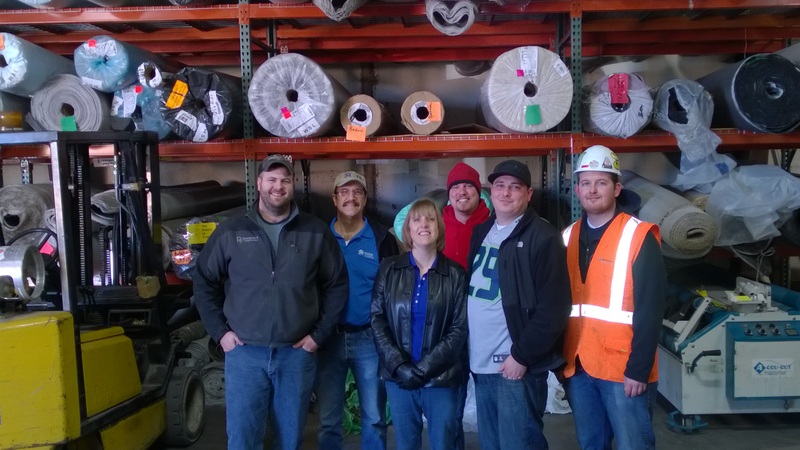 Division 9 Flooring, a specialty flooring contractor, recently donated 575 square feet of carpeting, to Seattle’s Union Gospel Mission. The donation put the Mission on the receiving end of giving. 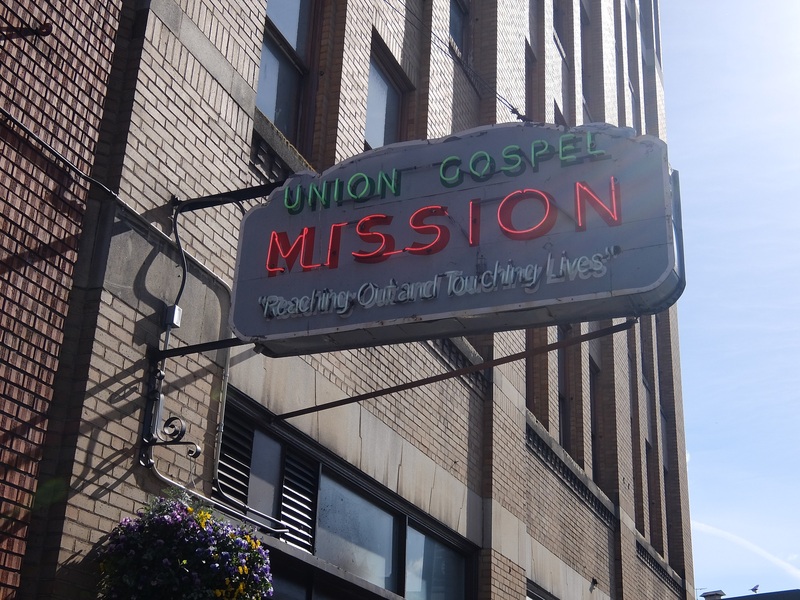 The Mission houses close to 300 in the Men’s Shelter and serves over 1500 meals a day to residents and those who are homeless and hungry on the streets of Seattle. 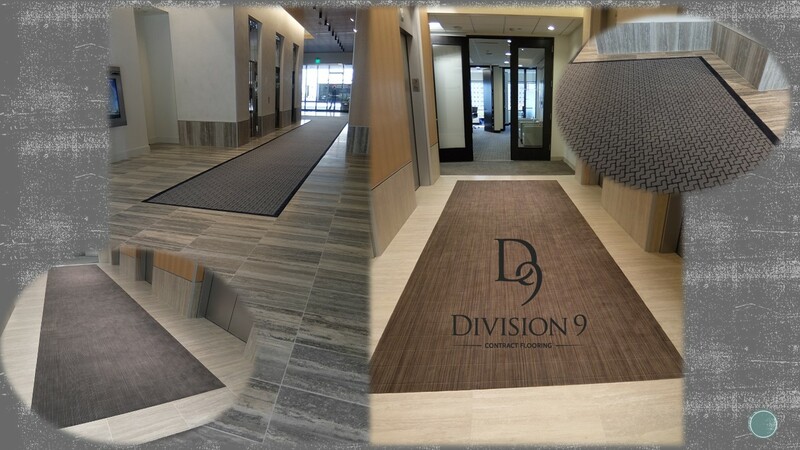 The Donation from Division 9 Flooring benefitted the Mission’s original building in Seattle’s Pioneer Square. The Mission opened it’s doors in 1932. The building is part of the Pioneer Square Historic District in Seattle, which protects the unique historic and architectural character of certain buildings. Posted on March 5, 2018 at 12:24 pm. Posted on March 3, 2018 at 9:32 am. Posted on February 27, 2018 at 10:55 am. Posted on February 24, 2018 at 8:14 am. 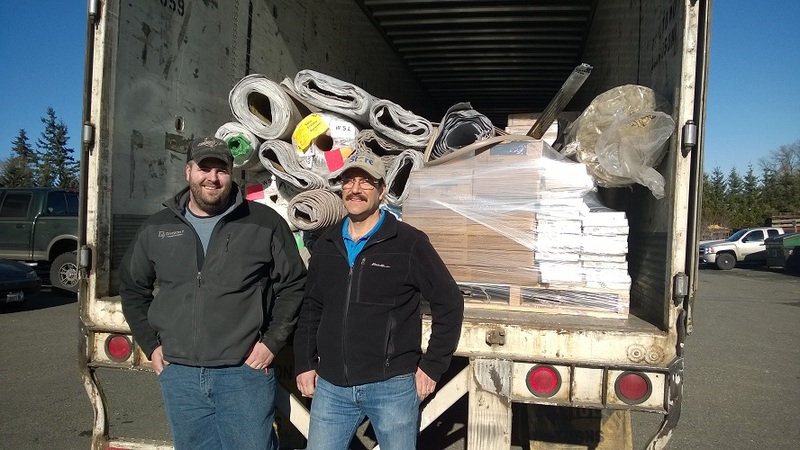 Division 9 Flooring has donated four loads of flooring and adhesives to support community improvement projects in Washington and California since June 2014. The donations benefited Habitat for Humanity partners in Lynnwood, Seattle, and Tacoma, Wash., as well as River Valley Community Outreach Center (RVCOC), a nonprofit in Gridley, Calif., that works to improve the lives of families in need in the Sacramento area. Mountain Re-Source Center, a nonprofit that seeks donations of usable materials to support the work of other nonprofit organizations, coordinated the donation on behalf of Habitat for Humanity and RVCOC. Heidi May of Division 9 Flooring said the company is proud to support local communities. Posted on February 17, 2018 at 10:49 am. Posted on February 16, 2018 at 8:36 am. We recently teamed with BNBuilders on the Amazon 635 Project. The project is located on Elliott Avenue on the Seattle Waterfront. The building is just over 187,000 square feet. It had sat empty since it was built in 2010. With the addition of the 635 project, Amazon has expanded their Seattle footprint to include the waterfront on Elliott Bay. 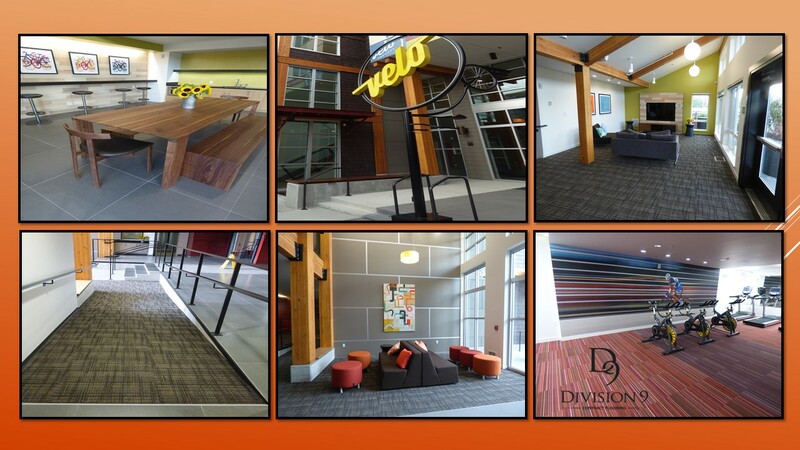 Division 9 has had the privilege of working on several Amazon projects. Each project is different. This one was a tenant improvement. 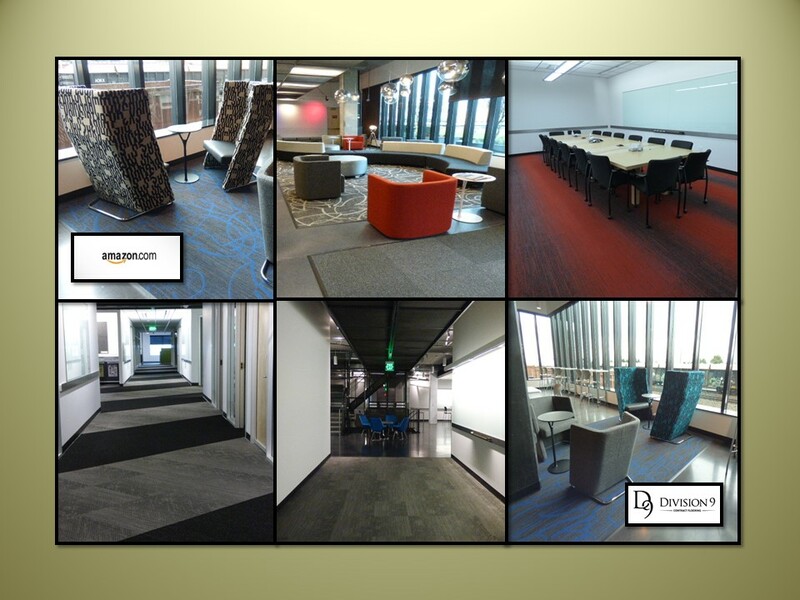 “Working with Division 9 on The Amazon 635 project was a pleasant experience because of D9’s professionalism and knowledge of the flooring industry. 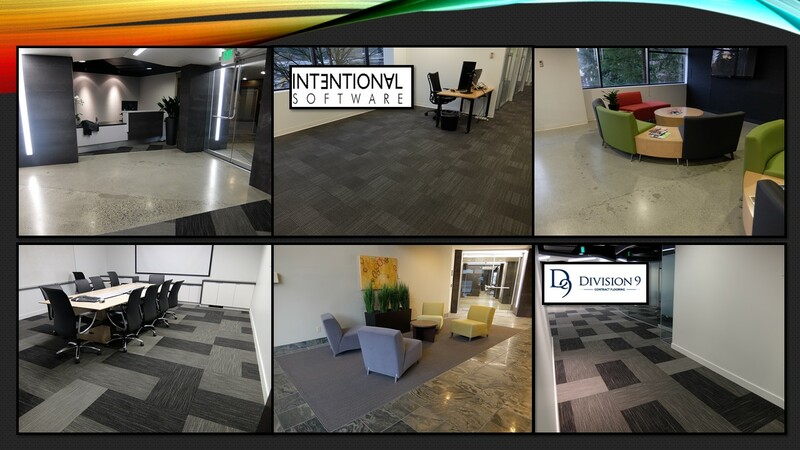 I’ve been fortunate to use Division 9 on several projects in the past. From wood flooring, carpet, ceramic tile to VCT, they have always met or exceeded my expectations. I look forward to continuing to use them in the future”. Amazon is part of the reason why Seattle is the fastest growing city in the country. All you’ve to do is take a look at all of the cranes and construction downtown to know. Posted on February 12, 2018 at 9:50 am. 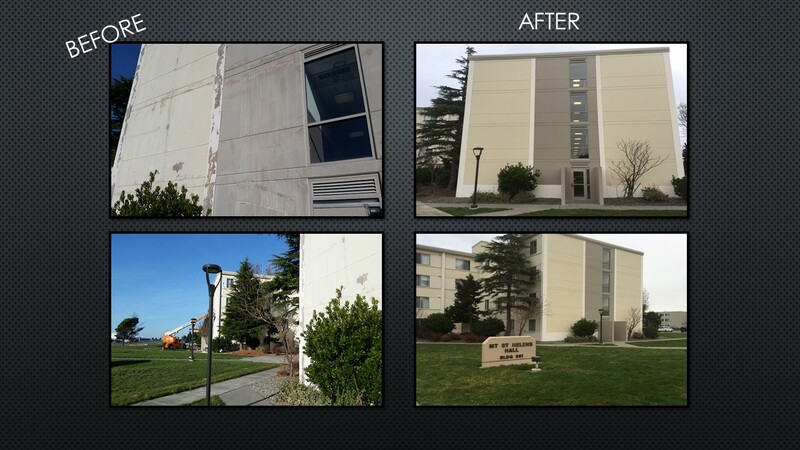 We recently finished a project at Wolf Creek Whidbey Island Naval Air Station. When you do a project involving the Navy, you can bet your work will be meticulously scrutinized. The project was two weeks start to finish. The weather conditions were a challenge as we were using a temperature sensitive product. The temperatures were monitored throughout and safety and pedestrian traffic were priority #1. 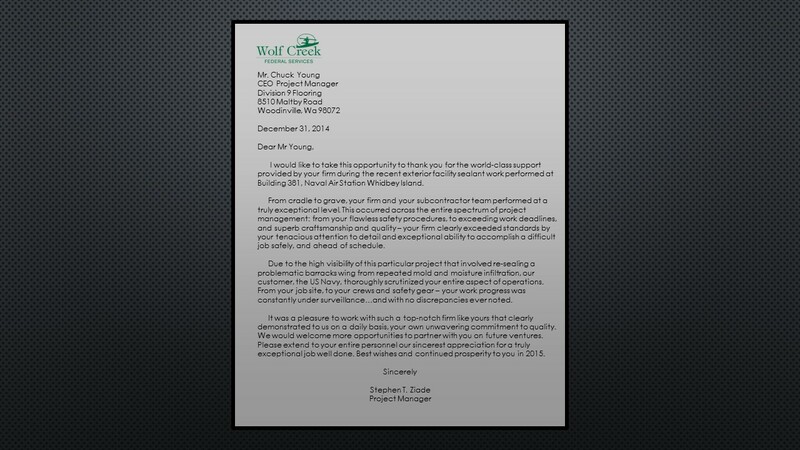 After the project was complete, we received an unexpected note from the Wolf Creek Project Manager. Cedarbrook Spa Gets The Works! Posted on February 4, 2018 at 10:55 am. 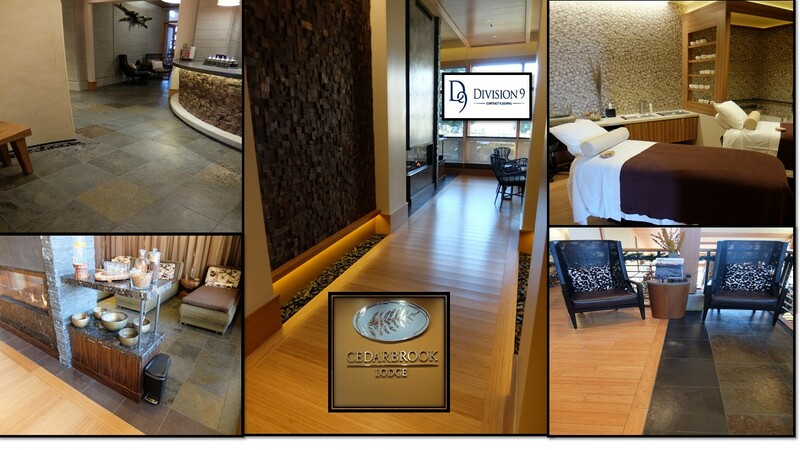 Division 9 recently worked with Lease Crutcher Lewis on the Cedarbrook Spa addition to Cedarbrook Lodge in Seattle. We’re very proud of how exceptional it turned out. “Let me start by saying Division 9 quality of work at Cedarbrook was fantastic. In regards to the tile installation: The quality of tile work is probably the best I’ve seen to date. Posted on January 21, 2018 at 5:00 am.